Earlier this year, a local NGO in Delhi filed a court petition demanding that the bus corridor be made open to mixed traffic. This post originally appeared on The New York Times’ India Ink blog on 26 October 2012. The authors, Dario Hidalgo and Madhav Pai, are senior staff with EMBARQ, the producer of this blog. Their comments are in response to the court ruling favoring the bus priority from the Moolchand intersection to Ambedkar Nagar in New Delhi. “In a landmark ruling that overturns conventional traffic engineering approaches, the Delhi High Court last week advanced the idea that transportation facilities are for moving people, not cars, and should favor all users, not just the minority fortunate enough to use private cars. In addition, it advocated introducing measures that move people out of cars and into public transportation. 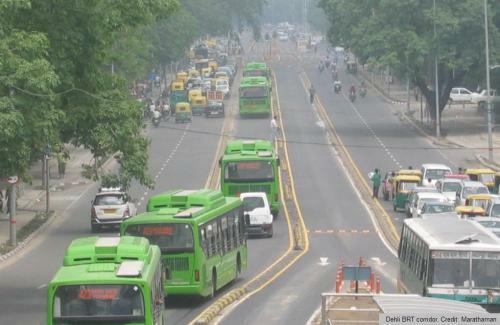 The ruling dismissed a petition demanding that the bus corridor from the Moolchand intersection to Ambedkar Nagar in New Delhi be scrapped to create more traffic lanes for private vehicles. The petition, filed earlier this year by Nyaya Bhoomi, claimed that the bus corridor was aimed at harassing commuters and was a waste of public money. It said it resulted in increased travel time for car users and longer idling time due to traffic jams, resulting in wastage of fuel. Darío Hidalgo is EMBARQ’s Director for Research in Practice. He has more than 20 years of experience as a transport expert, consultant, and government official. He has taken part in urban transport projects and taught training courses in 10+ countries of Latin America, Asia and Africa. Madhav Pai is the Director of EMBARQ India. Madhav has over 12 years experience leading, designing and managing urban transport programs and projects in India, Asia and United states. Prior to joining EMBARQ India he was Regional Director at Citilabs, a transport planning Software Company and headed operations in South and South East Asia. His work on progress of BRT projects under implementation in Indian Cities and his analysis on the Urban Transport situation in Indian Cities has been recently published. Public Transport in Delhi: Devising New "Clusters"